The mission of Topgolf is to provide fun entertainment for your family, for your business gatherings, and just the everyday person who is looking to sharpen their skills. Through technology that has been developed using microchipped balls, golfers hitting in the range can keep track of their accuracy and distance via TV screens set up in their bay. Whether you’re a novice or expert, adult or child, the spirit of Topgolf is have to fun, and hopefully sharpen your skills all the while. To amplify the enjoyment of your outing, a large and varied menu offers dining selections specially created by a chef, along with several fully stocked bars with top shelf beverages. The bays can be privately enclosed for you and your group, and big screen TV’s are present throughout so you can catch all the big game action. Other leisure offerings are available, such as a billiard room and table soccer. Simulator lounges allow you to experience all that technology has to offer to improve your game. And if you’re looking for a unique spot for your business needs, Topgolf offers private conference rooms that are fully modernized for your meeting requirements. The gorgeous, three floor, 65,000 foot facility (located right off exit 40B on Interstate 295) is quite an achievement. The site has more than 500 full and part time employees, all working to make your experience special. I had the chance to meet many of the folks, who were warm and accommodating; resident experts are there to also help you grow your golf game (something I need lots of help on!). It’s a facility and concept that most everyone should be proud to be associated with, and will without question receive a rave reception once it opens its doors this Friday. Posted in "Around Town" and tagged top golf mt. laurel, top golf south jersey, topgolf mount laurel. Bookmark the permalink. Posted in "Around Town" and tagged Assembly Rooftop Lounge, Benjamin Franklin Parkway, Diageo, logan square, Punch Media Philadelphia, Punch Media PR, Quaker City Mercantile, Quaker City Shrubs, Steven Grasse, Total Wine and More. Bookmark the permalink. Bowlero, the newly rebranded entertainment center (previously Brunswick Zone) had a grand re-opening at their Feasterville, PA location on Saturday, October 21st. Around Town was there to cover the event, which included an appearance by Philadelphia Eagles legend Brian Westbrook. 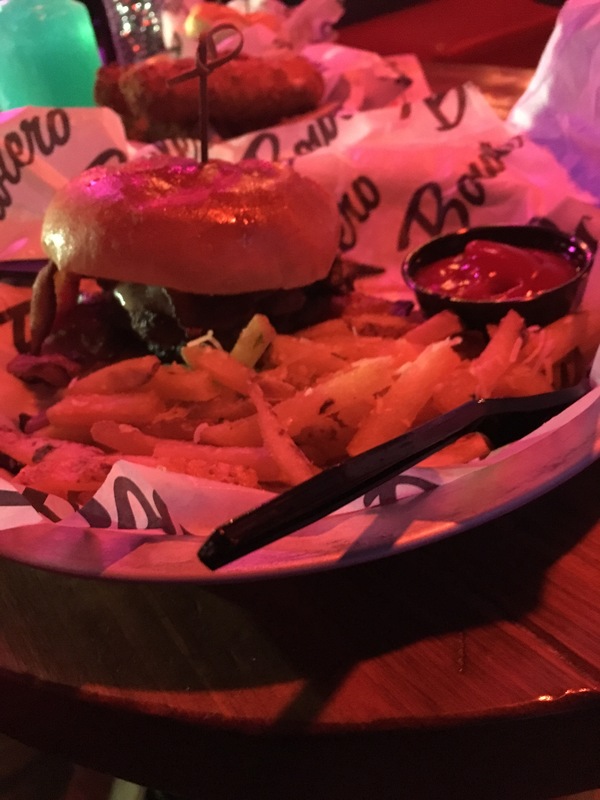 Bowlero Feasterville offers a fresh take on the traditional bowling experience, combining 48 blacklight lanes, a high-tech laser tag arena, state-of-the-art arcade, billiards, and interesting new food and drink items. The sprawling, beautiful facility underwent a major remodeling and transition to make it the premier recreation stop in Bucks County. 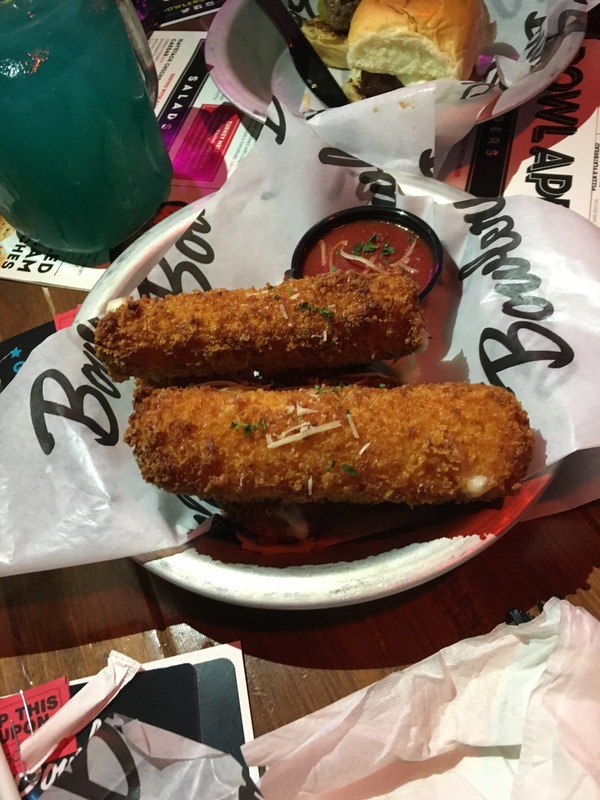 Around Town was treated to a wonderful day by the Bowlero’s friendly staff, and we had the good fortune of sampling some of the new menu items that will be featured. 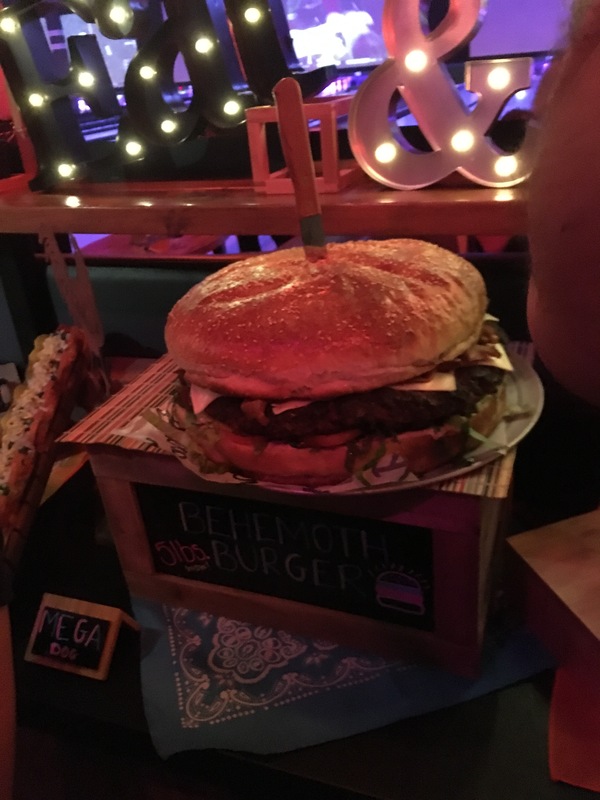 The Super Cheesy sliders were my personal favorite, but the regular sized burgers like the Cravin’ Bacon and The Monster were also out of this world. The Chi-Town Mega Dog brings the classic Windy City taste to the area. Huge portions are the theme, and the giant 5 lb. 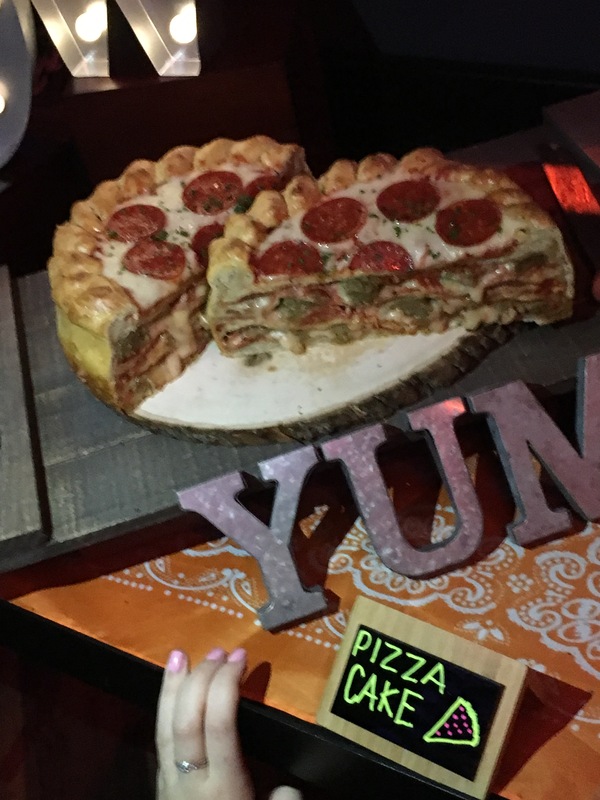 burger, the five layer pizza cake (and cupcakes), and 2-foot long dog were just the tip of the iceberg. 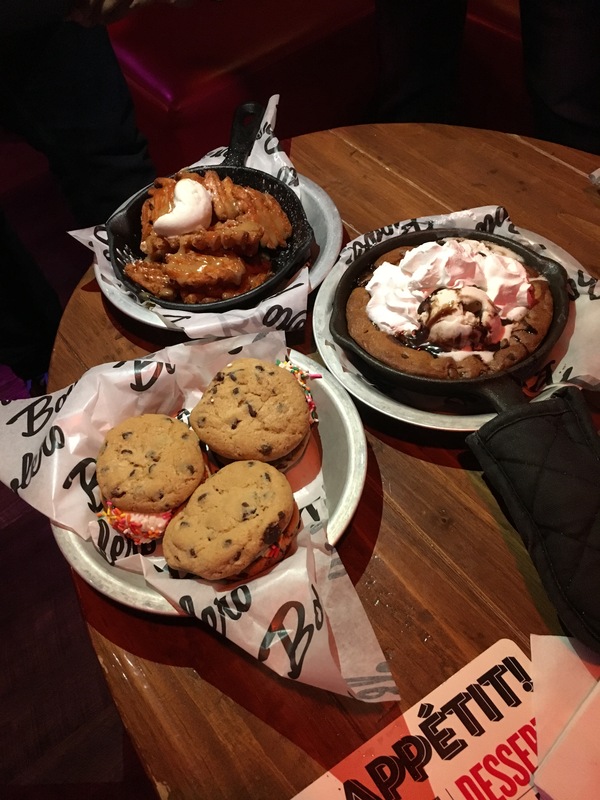 The dessert menu is heaven for any sweets lover, with the Monster Cookie Melt, Sweet Belgian Waffle Fries, and Sprinkled Ice Cream sandwiches all made fresh and delicious. An added bonus to our day was the presence of NFL great Brian Westbrook, who was on hand to award prizes, meet with an Eagles frenzied crowd, and throw a few games himself. The genial Westbrook brought out a large following to the Bowlero, a great opening day festivity to show off the fresh new center, and for the opportunity to meet one of our team’s all-time best players as well. Many new locally owned gaming centers have been sprouting up in the area, and Bowlero takes some of the ideas those places have tried out to the next level. The days of your traditional bowling alley have seemingly gone by the wayside, and as Bowlero continues to grow their brand and renovate their existing centers, their popularity is sure to grow. Technology has played a key role in these ideas and growth, with the popularity of virtual video games and laser tag soaring. The convenience of having these amenities, along with your traditional bowling alley, billiard tables, and great food and drink, all in one neatly designed building, is a plus for their business and for communities seeking fun and recreation. I had a blast at the Bowlero, and you should check it out to see a glimpse of the future in entertainment and gaming centers NOW. See you soon, around town! Posted in "Around Town" and tagged 5 pound hamburger, bowlero, brian westbrook appearance, ice cream pizza, laser tag bowling alley. Bookmark the permalink. Wylder, an Indie-rock group based out of Washington, DC, headlined the venue’s upstairs rock club on that evening. Blending a mix of rock, pop and folk, the band was in fine sound that is illuminated by their harmonies and melodic hooks. Their new single, “Save a Way”, has just been released and is available at their website wyldermusic.com, along with all of their prior work. The guys in the band were all a pleasure to meet, and take great pride and joy in performing their energetic set. Bourbon and Branch was a great setting for both artists to perform, as well as having a menu full of unique American fare food offerings. Their specialty, of course, is a long list of bourbon drink offerings to sample and choose from. The vibe was perfect for both musical acts, whom I enjoyed and highly recommend you check out for yourself. Posted in "Around Town" and tagged bourbon and branch philly, bourbon bar in philly, joy ike, joy ike philly, where to go see live music in old city philadelphia, wylder, wylder tour. Bookmark the permalink. Quark Expedition interviewed me about the Antarctic expedition I was a part of and my thoughts about the food. Click link below to read all the interview. Posted in "Around Town", Quick bites/Takeout, Restaurants, Small Bites Radio and tagged Antarctic expedition, how to get to antarctica, Quark Expedition, what is the food like on quark, where to eat in antarctica. Bookmark the permalink. A lot can happen in sixty years. A man walked on the moon. People started to watch television in color. Doctors stopped recommending smoking. There have been inventions from Atari, Apple, and Microsoft. The internet was invented. We have driverless cars. And can you believe it, businesses and citizens from the United States (under certain regulations) are allowed to visit and do business in Cuba again? Our main base during our stay was the Starwood Hotels and Resorts brand “Four Points by Sheraton” the first American hotel and leisure company, headquartered in Stamford, Connecticut to offer hospitality on the island. The resort is situated in the affluent Miramar district of Havana. The pool area was beautiful, the staff extremely friendly, the room spacious, and the breakfast buffet was varied and tasty. By Cuban standards these were very high end accommodations. For the rack room rate of $800 a night (around $500 a night online), one certainly expects more though. This may change over time as it is evident Starwoods is working hard to improve the conditions and services offered at the resort, but certain aspects of the stay just do not make the grade yet. They may be better suited to offer concessions of some sort for booking Four Points Havana that you can use at another resort worldwide or Starwoods points credit to be used at a later date. I am happy I was able to visit Cuba now. You can tell Cuba is changing and it will look a lot different in the near future. In Miramar there are signs showing that a sandy beach is going to be built where a beautiful natural reef exists now. In Old and Central Havana, China is building hotels, rebuilding the markets, docks, and train stations in several locations around the city. The agreement, as we were told, is that China is going to completely own these properties which was previously unheard of in Cuba. They have been permitted to use Chinese workers and bring in Chinese products and produce. This could be a deal with the devil as the United States knows all too well. I checked the labels of everything we were consuming and purchasing, it was comforting to see that at least eighty percent of everything we were using or buying was directly grown, produced, or made in Cuba. When dealing with China, this will change rapidly and probably not for the better, when it comes to the quality of products or economic gain for the people of Cuba. To be able to walk, talk, eat, and be entertained in a mostly socialist style economic system was a priceless and educational experience. There are no easy answers to which lifestyle is better or worse. It is not possible to weigh which is right and which is wrong. Even after traveling the world, visiting all seven continents, the solutions to obtain peace, decent wages, and standards or rules for fair housing are still elusive. Whether it be democracy, republic, autocracy, dictatorship, or communism one would have to assume there must be a middle ground somewhere that could make utopia on earth possible. Information is power, and hopefully with more people connected to each other, this dream, this compromise, could one day become a reality. Even with the proliferation of cell phones, it was surprising that at some locations, it was not recommended or forbidden to take pictures. The answer was not given as to why, nor did I ask. I would assume it is because they do not want anything that could be construed as negative to spread or be seen by others. I experienced this before in China and certain parts of Africa where quite frequently you were told cameras had to be put down or turned off, but everything I saw in Cuba was positive and nowhere near the atrocities that we hear about in parts of Philadelphia or Camden on a daily basis. Yes, certain areas were more economically distressed than others and some unsavory characters were present, but at no time did I feel threatened or unsafe in any manner during our visit. Posted in "Around Town", Quick bites/Takeout, Restaurants, Small Bites Radio and tagged cuba, Four Points Havana, how to get world peace, how to visit cuba, la habana, miramar havana cuba, new beach in miramar, philly gringos, starwoods hotels, what is cuba like, where to eat in cuba, where to eat in havana, where to go in cuba, where to go in havana, where to visit in miramar. Bookmark the permalink. “Rolled ice cream” is something that has taken off recently in the States. 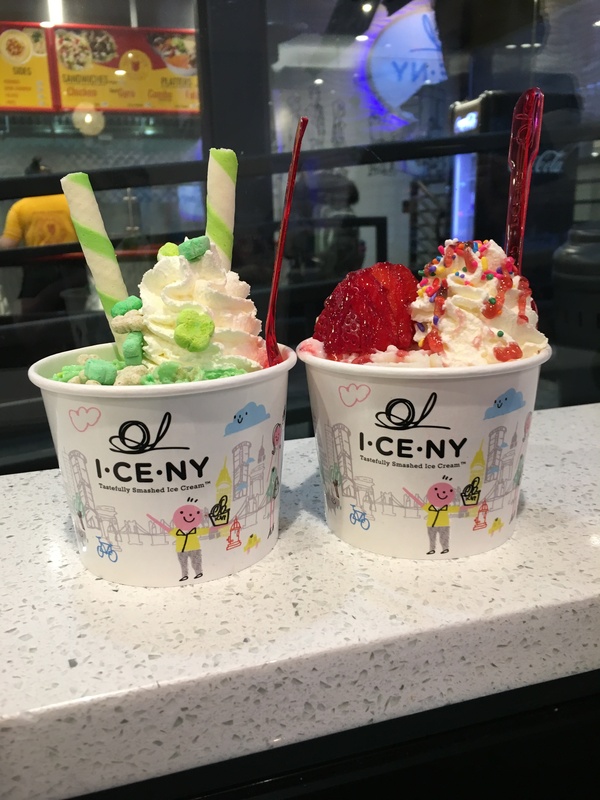 The operators of I-CE-NY claim origination of the process and treat in Thailand. The preparation is interesting in itself to watch. The expert staff begin by using flavored milks which they pour onto a frigid circular dish (temperature well below zero). As the milk freezes up, it is crafted using spatulas and small knives, ultimately leading to the “rolls”. Additional toppings are added as requested, as they are in any great ice cream bar. We tried the St. Patty’s Day special, with mint ice cream and Lucky Charms. The result is unique and more gratifying then your normal every day scoop. Strawberry and banana was next on the list, and the flavor was bold and fresh. 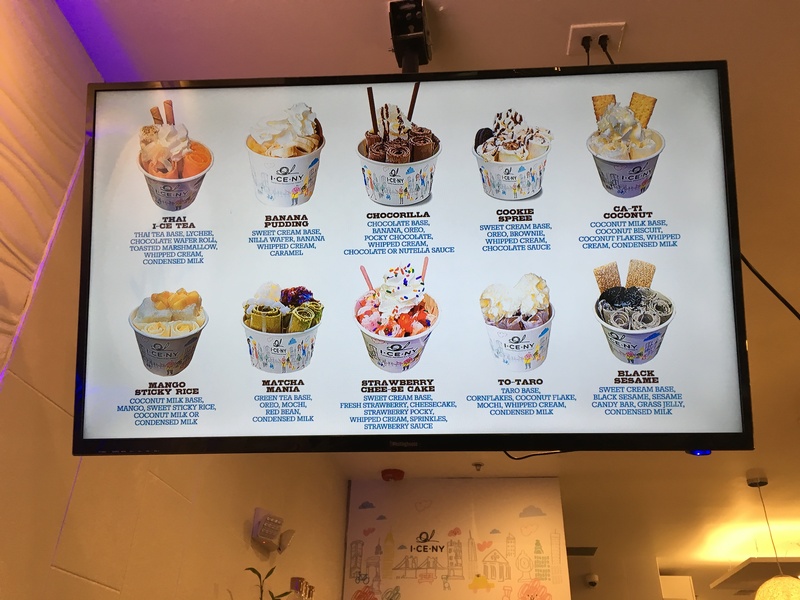 The combinations are endless, with many different ice cream bases and toppings to choose from. Posted in "Around Town" and tagged chinatown philly, chinatown square food hall, I-CE-NY at Chinatown Square Food Hall, ice cream made fresh, rolled ice cream. Bookmark the permalink.